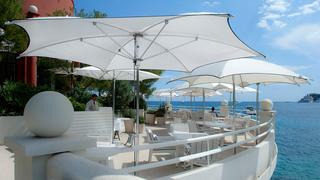 Monaco’s finest restaurants are spangled with Michelin stars and most offer views to rival the quality of their fare. Here is our guide to nine of the best to visit during the Monaco Yacht Show. 1. Alain Ducasse à L'Hôtel De Paris Alain Ducasse’s Rococo fortress Le Louis XV in the Hotel de Paris (one of the best hotels in Monaco) is the only three Michelin star restaurant in Monaco and regularly voted as one of the best restaurants in the world. It’s also the most iconic in Monaco — opened in 1987 it even predates the Monaco Yacht Show. Specialties include Gamberoni from San Remo with rock fish gelée and caviar, or steamed langoustines, flavoured with peach and sesame with a side of green beans. Alternatively, foodies can indulge in a gourmet set menu for €360, which boasts four half dishes selected by the chef, cheese and a dessert. 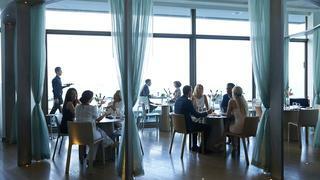 Monaco’s finest restaurants are spangled with Michelin stars and most offer views to rival the quality of their fare. Here is our guide to nine of the best to visit during the Monaco Yacht Show. 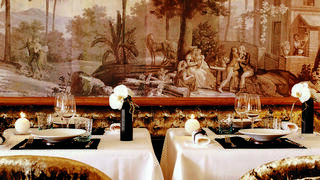 Alain Ducasse’s Rococo fortress Le Louis XV in the Hotel de Paris (one of the best hotels in Monaco) is the only three Michelin star restaurant in Monaco and regularly voted as one of the best restaurants in the world. It’s also the most iconic in Monaco — opened in 1987 it even predates the Monaco Yacht Show. Specialties include Gamberoni from San Remo with rock fish gelée and caviar, or steamed langoustines, flavoured with peach and sesame with a side of green beans. Alternatively, foodies can indulge in a gourmet set menu for €360, which boasts four half dishes selected by the chef, cheese and a dessert. A light, bright restaurant and a terrace with gorgeous views make Elsa, at the Monte Carlo Beach Hotel, a seriously cool spot for lunch during the Monaco Yacht Show. 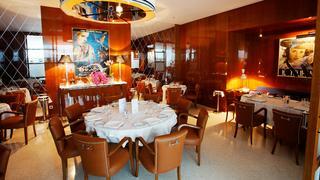 The Michelin star also makes it an excellent choice for those who come for the food. Chef Paolo Sari’s 100 per cent organic menu focuses on local produce and this year has been refreshed to offer four different menu options. The Tradition Menu, €160 per guest, offers eight courses from around the Mediterranean with dishes including red raw shrimp from Sanremo and responsibly sourced red mullet. A light, bright restaurant and a terrace with gorgeous views make Elsa, at the Monte Carlo Beach Hotel, a seriously cool spot for lunch during the Monaco Yacht Show. The Michelin star also makes it an excellent choice for those who come for the food. Chef Paolo Sari’s 100 per cent organic menu focuses on local produce and this year has been refreshed to offer four different menu options. The Tradition Menu, €160 per guest, offers eight courses from around the Mediterranean with dishes including red raw shrimp from Sanremo and responsibly sourced red mullet. 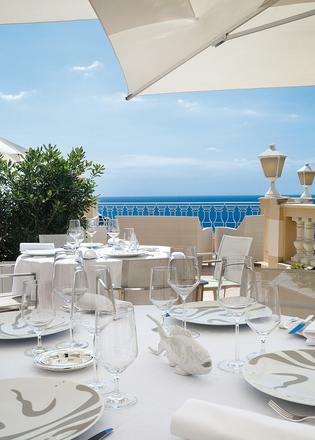 Le Vistamar offers the kind of views the name suggests and one Michelin Star cuisine that’s just as awe-inspiring. There are plenty of options for sharing with Chef Witz’s menu, including the homemade crustacean pasta served with lobster, spiny lobster and gamberoni. The Business Lunch Menu, €59 for two courses and half a bottle of mineral water or a glass of wine, is a great option during the Monaco Yacht Show. If you are craving modern Japanese flavours during the Monaco Yacht Show then head for Yoshi. The restaurant at the Hotel Metropole Monte-Carlo is the first Japanese addition to Joël Robuchon’s Michelin Star-sprinkled list of eateries. Executive chef Takeo Yamazaki designs modern menus with clean flavours at this extraordinary venue, including dishes such as Wagyu no wasabit fumi (rib steak with wasabi and vegetables), Kabu to omaru-ebi (lobster ravioli and marinated turnips) and Foa gura to unagi (foie gras and grilled eel millefeuille), and serves them in a chic east-meets-west dining ambience. 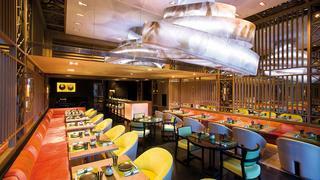 If you are craving modern Japanese flavours during the Monaco Yacht Show then head for Yoshi. The restaurant at the Hotel Metropole Monte-Carlo is the first Japanese addition to Joël Robuchon’s Michelin Star-sprinkled list of eateries. Executive chef Takeo Yamazaki designs modern menus with clean flavours at this extraordinary venue, including dishes such as Wagyu no wasabit fumi (rib steak with wasabi and vegetables), Kabu to omaru-ebi (lobster ravioli and marinated turnips) and Foa gura to unagi (foie gras and grilled eel millefeuille), and serves them in a chic east-meets-west dining ambience. Monaco’s first restaurant in the haute cuisine collection, Nobu opened in December 2013 at the Fairmont Monte Carlo hotel. The menu, designed by chef Nobu Matsuhisa, includes dishes such as seared dover sole, king crab leg with shiso salsa and Japanese wagyu beef, which can be prepared in a variety of styles including Tataki, new style, grilled steak or Toban Yaki. 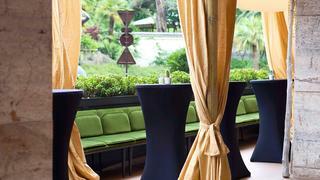 Joël Robuchon’s signature Monte Carlo restaurant is left in the highly capable hands of Christophe Cussac. The flagship restaurant of the Metropole hotel, it is famed for its open plan kitchen and chef’s table allowing guests to have a truly inclusive experience. If specialities such as langoustine in truffled ravioli with steamed green cabbage and hot duck with apricots with Amaretto appeal, make sure you pencil in a visit during the Monaco Yacht Show. Joël Robuchon’s signature Monte Carlo restaurant is left in the highly capable hands of Christophe Cussac. The flagship restaurant of the Metropole hotel, it is famed for its open plan kitchen and chef’s table allowing guests to have a truly inclusive experience. If specialities such as langoustine in truffled ravioli with steamed green cabbage and hot duck with apricots with Amaretto appeal, make sure you pencil in a visit during the Monaco Yacht Show. 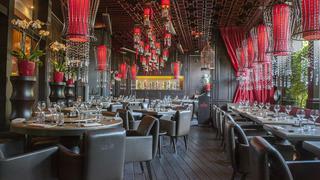 Monaco’s first gourmet Chinese restaurant comes from the creators of the two Michelin starred Hakkasan. The restaurant’s modern interior, featuring vibrant green velvet chairs, jet-black walls and brass fittings, compliments the glamorous Chinese cuisine. Song Qi is famed for its Peking duck caviar, so make sure that is included in your order. Situated side-by-side in Le Rocabella, Maya Bay's iconic Japanese restaurant was followed by it's Thai offering next door. Both offer the highest quality Asian dishes. Chef Rhuji Kakizaki has created the menu at Restaurant Japonais, which features a huge array of sushi, sashimi, dim sum and flavoursome noodle soups. The tuna with red pepper, java pepper and timur berries is an excellent choice alongside the sautéed lobster with vegetables and chilli. Chef Christophe Dupuy runs the show at Restaurant Thaïlandais, with a range of speciality curries, soups, salads, dumplings and spring rolls. Don't miss the 100 per cent Wagyu beef tenderloin or the Maya crispy spit-roast duck. Situated side-by-side in Le Rocabella, Maya Bay's iconic Japanese restaurant was followed by it's Thai offering next door. Both offer the highest quality Asian dishes. Chef Rhuji Kakizaki has created the menu at Restaurant Japonais, which features a huge array of sushi, sashimi, dim sum and flavoursome noodle soups. The tuna with red pepper, java pepper and timur berries is an excellent choice alongside the sautéed lobster with vegetables and chilli. Chef Christophe Dupuy runs the show at Restaurant Thaïlandais, with a range of speciality curries, soups, salads, dumplings and spring rolls. Don't miss the 100 per cent Wagyu beef tenderloin or the Maya crispy spit-roast duck. A high-profile spot where plenty of famous faces have been known to dine, Cipriani boasts a nautically-themed interior as well as an upstairs private bar with a sea view terrace, exclusively for members of Club Cipriani. Situated at the bottom of the Mirabeau building, the Italian restaurant has a nautical vibe with blue and white embellishments. Some of the restaurant’s classic dishes include homemade baked green tagliolini with veal ragu and tagliolini alla Cipriani with ham.